Harvard University is not legally required to divest from the fossil fuel industry, a Massachusetts Appeals court ruled last week, reaffirming a lower court ruling that struck down a suit from student activists. In 2014, a group of seven students filed a lawsuit arguing that Harvard’s investments in the fossil fuel industry were a violation of the University’s charter and contributed to global climate change. A Superior Court judge dismissed the suit in March 2015, ruling that the students did not have legal standing to challenge the University’s management of its investments. The students, called the Harvard Climate Justice Coalition, appealed the decision to the Massachusetts Appeals Court, which upheld the Superior Court judge’s dismissal. 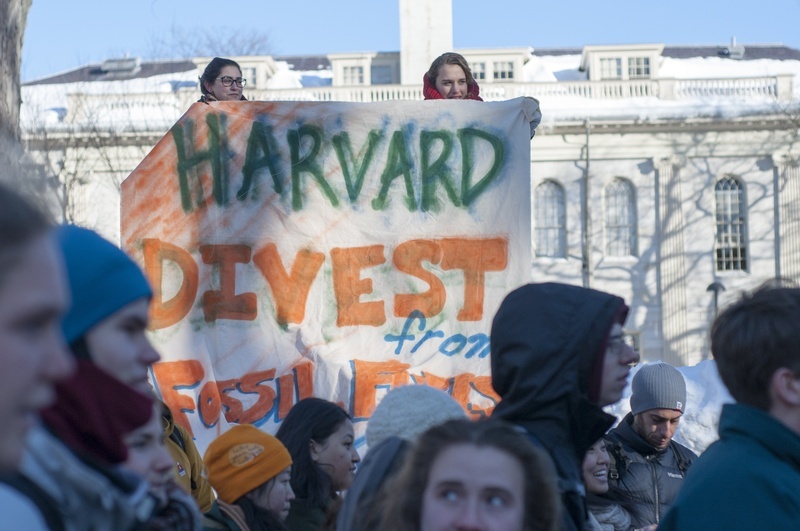 Divest Harvard students rallied for Global Divestment Day in 2015. “The plaintiffs, moreover, fail to show that they have been accorded a personal right in the management or administration of Harvard's endowment that is individual to them or distinct from the student body or public at large,” Appeals Court judge Elspeth B. Cypher wrote in the ruling. The Appeals Court also took issue with the students’ argument that they represented the interests of future generations of people. University President Drew G. Faust has said repeatedly that Harvard will not divest its endowment from fossil fuels, calling such a move unduly political for an academic institution. Joseph E. “Ted” Hamilton, one of the plaintiffs in the lawsuit and a member of the Harvard Climate Justice Coalition, wrote in a statement that the ruling was disappointing. The coalition is weighing its options for future litigation, Hamilton wrote. Anna Cowenhoven, a Faculty of Arts and Sciences spokesperson, wrote in a statement that the University was “pleased” with the court’s ruling. “We agree that climate change poses a serious threat to our planet, but respectfully disagree with the students who brought the lawsuit on the means by which a university should confront it,” Cowenhoven wrote. Since its large “Heat Week” protest in spring 2015, Divest Harvard has hosted several demonstrations against Harvard’s investments in the fossil fuel industry, but generally has been less active. In April 2016, police arrested four students who had hosted a sit-in in the lobby of the Boston Federal Reserve building, which holds the offices of Harvard’s investment arm, Harvard Management Company.